Update: "...What's in a Name? 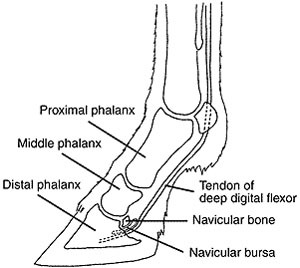 Navicular bursa (the cushioning fluid-filled sac between the navicular bone and the DDFT. Navicular disease is essentially a chronic degenerative condition of the navicular bursa and navicular bone that involves damage to the flexor surface of the bone and the overlying deep digital flexor tendon with osteophyte formation on the lateral and proximal borders of the bone. It is a syndrome with a complex pathogenesis rather than a specific disease entity. It is one of the most common causes of chronic forelimb lameness in horses but is essentially unknown in ponies and donkeys. Palmar foot pain is a modern term for navicular syndrome. Reference will also be made to phrases such as navicular region pain and caudal heel pain to describe horses with chronic forelimb lameness caused by pain stemming from the navicular bone and related structures. Navicular disease is most commonly diagnosed in horses between 4 and 15 years of age. Quarter Horses and Thoroughbreds are affected more than any other breeds. Ponies and Arabian horses are rarely affected. Navicular disease can be treated but rarely cured. Medications: Pain medications such as phenylbutazone . Isoxsuprime and aspirin are used to improve blood supply to the navicular bone. Tildren is a new medication that is showing promise; however, is not yet approved by the FDA. Your vet may be able to request and get approval to use it. Navicular bursa injections with corticosteroids intra-articular Adequan , hyaluronic acid and other medications.